Order within the next... 5 hours, 33 minutes, 54 seconds ...for dispatch today! Matched with a stunning 15.75 inch Spanish board. Another excellent set of quality and historic pieces by the renowned Italfama of Italy. 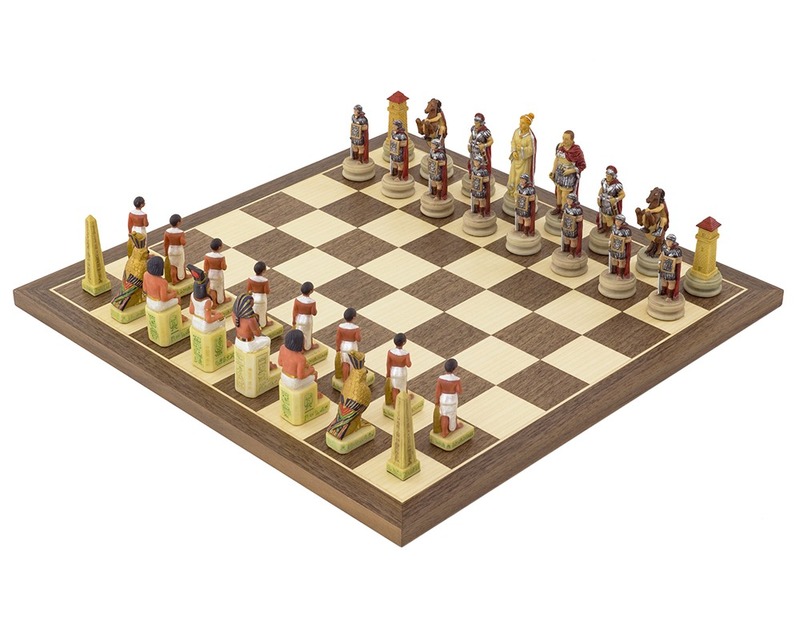 Beautifully crafted and painstakingly handpainted, these chess men boast exquisite detail. Marc Anthony, a Roman politician and general who supported Julius Caesar, leads the The Romans on this battle field. Known for his affair with Cleopatra who bore him three children, he also played a critical role in the transformation of the Roman Republic and served as one of Caesar’s generals during the Conquest of Gaul and the Civil War. Octavia, Marc Anthony’s fourth wife, stands by him as his Queen. The elder sister of Augustus, the first Roman Emperor (aka Octavian), she was one of the most prominent women in Roman history. Respected and admired by contemporaries for her loyalty, nobility and humanity, she maintained traditional Roman feminine virtues. The Bishop is represented by a Centurion, a professional officer of the Roman Army most of which commanded groups of about 80 men. 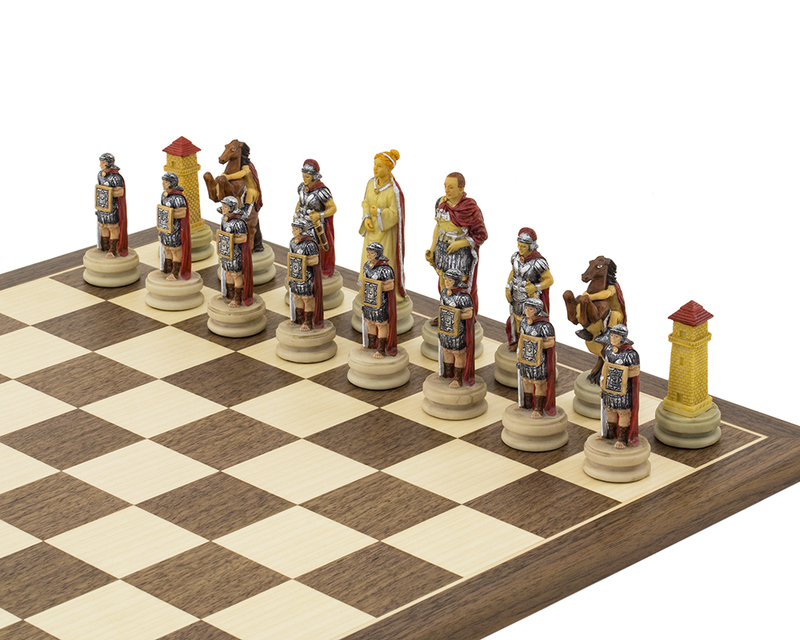 An eques (plural is Equites) naturally represents the knights because of the involvement of horses. The rooks are depicted by a Roman tower and bringing up the rear are the legionaries, professional heavy infantry, who were made up of Roman citizens under the age of 45 and required to serve 25 years. We believe the Egyptian army is led by Caesarion born on June 23, 47 BC to Cleopatra and Julius Caesar. Although not acknowledged by his father, Cleopatra hoped Caesarion would eventually succeed the Pharaoh. Following Caesar’s assassination however, mother and son returned to Egypt where the now 3 year old Caesarion was named co-ruler with his mother. 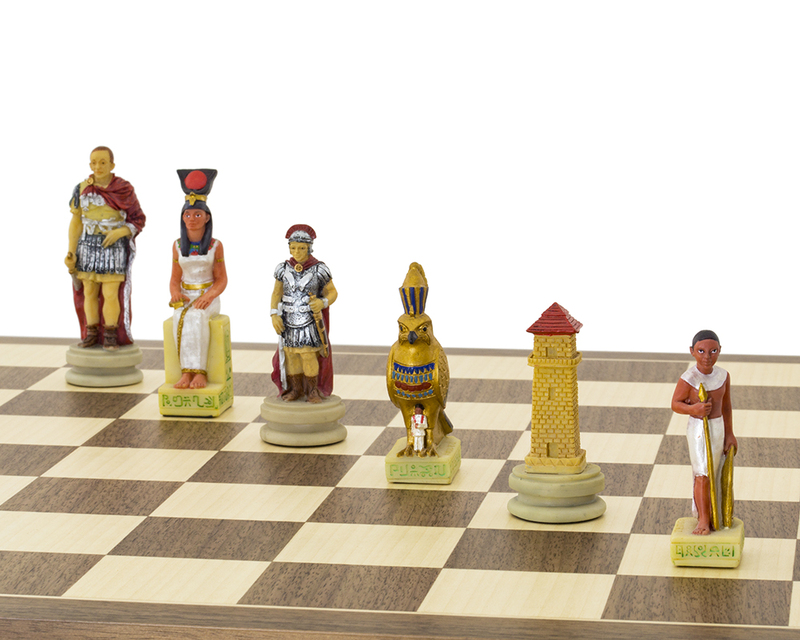 The bishops in this historic set are represented by two scribes. Responsible for writing books or documents by hand, scribes also helped keep track of records for priests and government and supervised as well as document the construction of monumental buildings. It is thanks to such scribes that much of what is known about ancient Egypt. Horus, one of the most significant deities of Ancient Egypt, has been chosen to represent the knight. Most often depicted as a falcon or a man with falcon head, Horus was worshipped from at least the late prehistoric Egypt until the Ptolemaic Kingdom and Roman Egypt. 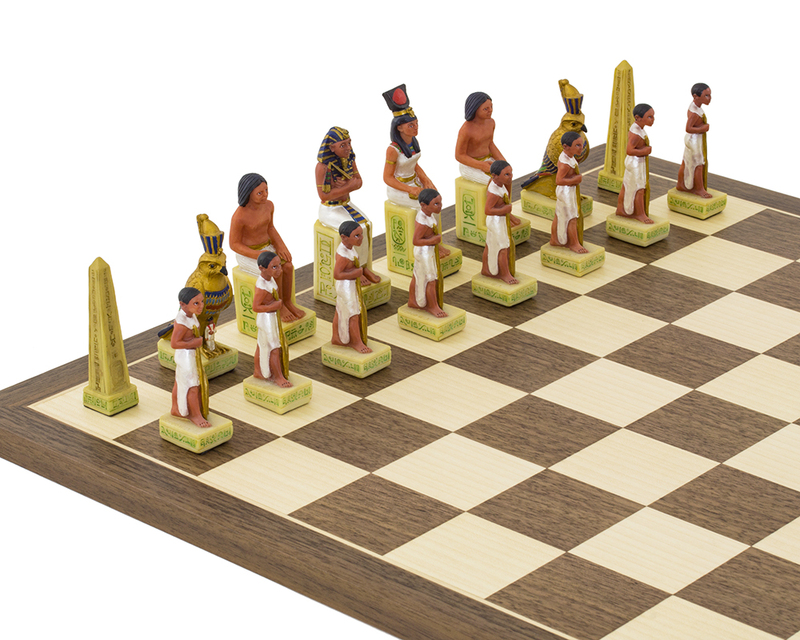 The pawns are represented by the Egyptian infantry who were partially conscripted and partially voluntary. 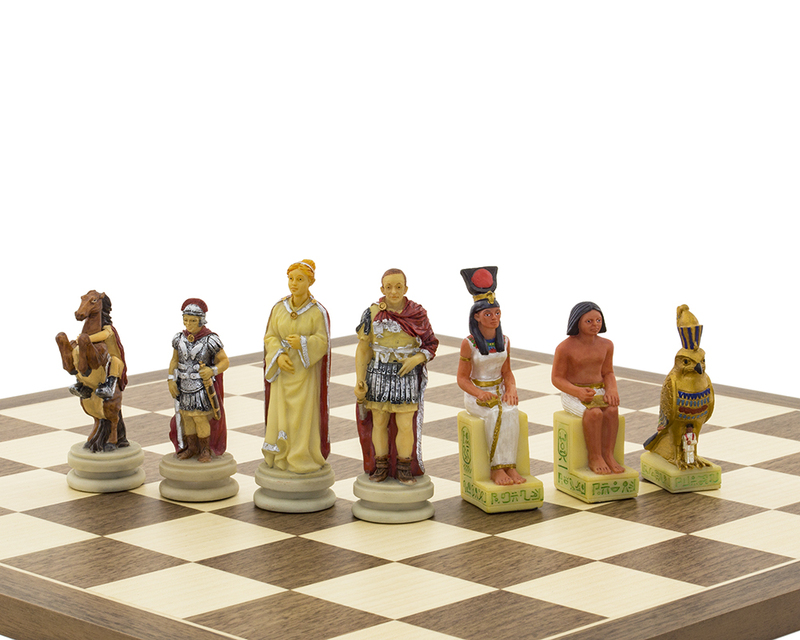 A stunning 15.75 inch walnut and maple Spanish chess board makes for a great battle field however these historical pieces are also available on their own The Romans vs Egyptians Hand Painted Themed Chess Pieces by Italfama. 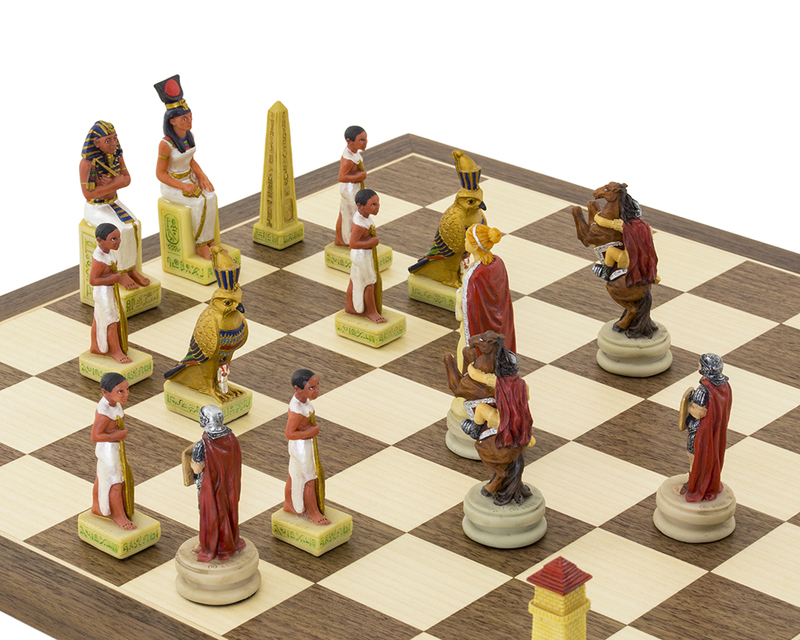 With or without a board, they make a stunning gift for any Ancient Egypt/Chess enthusiast.